I've read more 'how to improve your blog' posts than I care to admit. Most are full of the same old tripe: 'good photos', 'make interesting content'. These make me so angry; why am I wasting my time on this bull again? Having said that, I do tend to get lazy or forget them half the time, but let's gloss over that. Every so often, I come across a tip that completely changes the way I blog for the better. 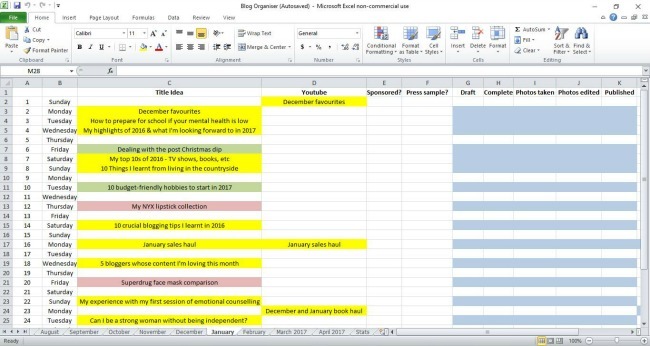 The advice to use spreadsheets to help with blog planning? That's probably the best example I have. Before we start, let me just mention that I'm not some kind of Excel whizz. I'd have no idea how to put in an equation, or get it to do anything even marginally complex. I'm here for the ease of editing, and because setting up any kind of table on Microsoft Word takes so damn long, and even longer if (god forbid) you want to want to edit it. As you can (possibly) see, I have a page, or 'sheet' for each month. These run along in a line at the bottom. It helps to keep things simple, and means I don't have to scroll through a mammoth amount of cells to see what upcoming posts I have planned. At the end of these, I have a page titled 'stats', but we'll get onto that later. As soon as I open up a new sheet for a new month, I input however many days there are in the month in the first column, so it usually runs from 1 to about 30. I then put the days of the week in the next column. This just makes it easier for me to see what days I'm going to be posting on. I know that I work a split on Thursdays, for example, so I won't have time to blog, and it helps me plan around that. Then, in the first row (horizontal) I have the following headings: Title, Youtube, Sponsored?, Press Sample, Draft, Complete, Photos Taken, Photos Edited, Published, Video Edited, Uploaded to Youtube. As soon as I've completed any of these, I mark the box in a light blue. It especially helps me keep track of blog photos I've taken, as in the past I've been SO disorganised with this! At the moment, I've got all of my photos sorted for the next four posts (I had a lil session this morning, as you can probably tell! ), and I've got them marked so that I know the photos are ready to go. Title ideas is probably the most important column I have. This is where I plan the date that posts will go up, and what I'll call them. I usually start off with a rough idea for the name, and tweak it until I'm happy with it. 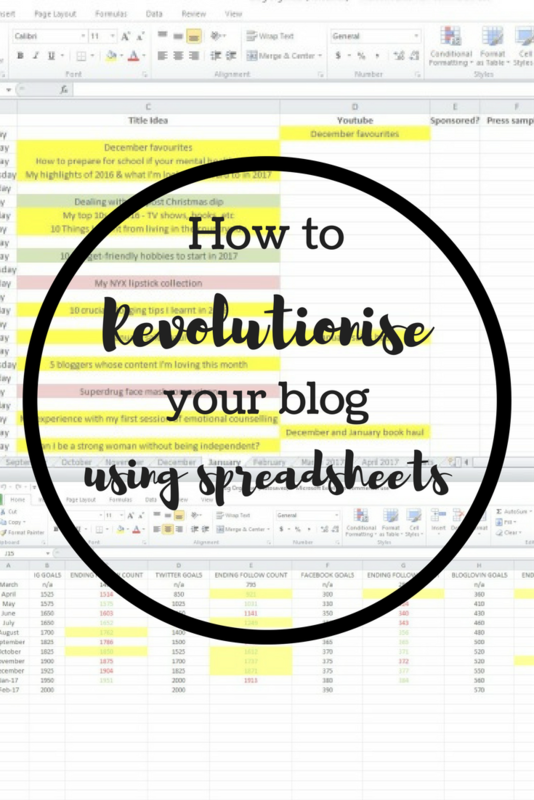 So, this post started off being called 'how using spreadsheets revolutionized my blog' and I twisted it a little to become 'how to revolutionize your blog using spreadsheets'. A subtle difference, but I'm much happier with it. Having the 'title ideas' section means I can pop in a blog post idea as soon as it comes to me without having to stress about what it's final name will be. As you can see I *try* to post every other day, and having this spreadsheet keeps me on top of that. I tend to have blog posts planned for the next month and a half or so, but having a spreadsheet means that if an urgent idea comes along, I can move everything about easily and slot it in. Sometimes I sit down and have a big brainstorm about all the kind of posts I would like to write, and jot down 5-10 in one sitting, but that doesn't happen too often. Everytime I get inspired, I think of a post, and slot it in the schedule. If it comes nearer to the time of writing it and I realise that, actually, I don't like the idea enough, then I simply switch it out for something that's scheduled later on. It's nice to have the backup of being able to do that, as it means that I no longer feel forced to write certain content that I've lost the passion for. Having a spreadsheet for my blog has been an absolute lifesaver when it comes to organising collabs or sponsored posts. I used to be a really unreliable blogger to work with, I won't lie. I'd never have a date in mind for the post, sometimes I would forget about collabs completely and all round it was just a bit of a mess. Now, as soon as I receive a product, or sponsorship, the post goes straight into my schedule. I decide how long I want to take to try out the product, and then pencil in a date. This means I can immediately email the PR to check that the date works for them, as well as working for me. It also stops me from piling lots of collaborative posts on top of each other because I've left them right up until the end of the deadline. I've obviously got the 'sponsored' and 'press samples' boxes, so as soon as they're highlighted, it's easy to tell whether I've spread the collab'ed posts out well enough. This just makes life with PRs ten times easier for me and them. They know exactly what's going on, I have time to write a good post, and there's no antagonism between us because of stress. Okay, okay, this is just an extra little tip, and something that I love to do, because (if you haven't guessed already), I'm a bit obsessed with the whole organisation thing. I effectively have a colour per 'theme'. So: lifestyle is yellow, beauty is pink, mental health is a pale green, travel is a darker green, etc. This is possibly(?) my favourite part of my spreadsheet. Each month has its own row, and I add every new month on as necessary. 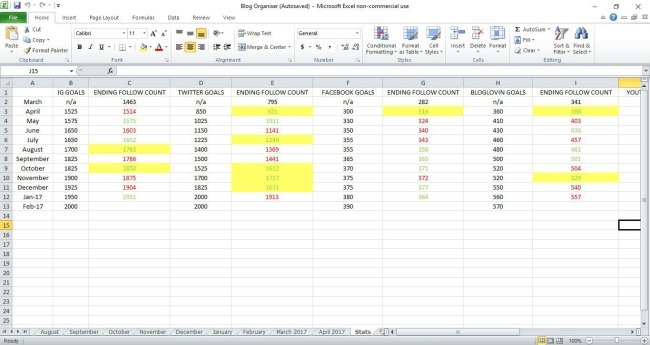 Then I have quite a few columns, as follows: 'IG Goals, End Follow Count, Twitter Goals, End Follow Count, Facebook Goals, End Follow Count, Bloglovin Goals, End Follow Count, Youtube Goals, End Follow Count, Bounce Rate, Pageviews, Pageviews Improvement, Pages/Session'. End follow count is the number of followers that I end the month on. On the first day of every new month I pop in the end follow count and set myself new goals for the month. This is one of my absolute favourite things to do, as it gets me in gear and motivated to achieve bigger and better things in the coming month. If I complete the goal, I mark it in green, and if I don't, I mark it in red. If I surpass the goal by a lot, then I highlight it in a pale yellow. This helps me to see which months have proved best for me, and which social media platform is growing the quickest (it's usually my Twitter, as you can see by the amount of yellow highlighting in that column). I might do a post all about Google Analytics and what I get out of it soon, but I thought I'd explain a little bit about my last few stats to you. Page views are fairly self-explanatory, so I won't go through that one. Page views improvement is simply the percentage that my page views have increased (or decreased, boo) from the previous month. The bounce rate is a percentage of how many users come to your site and only visit one page before bouncing off leaving. Pages/session is fairly similar. It tracks the average number of pages people have viewed on your blog in one session, or one visit to your blog.